I have been going to Pertaringa for a number of years – partially because it was close to my favorite 1980’s and 90’s cellar door (Noons) and partially because of the wonderful red wines. 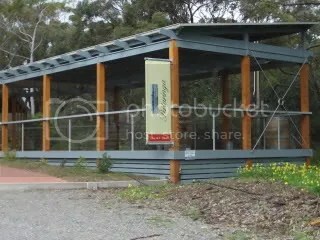 So with this visit, with my father in law in tow, I was quite excited to be visiting this revamped cellar door again. I remember the shed from all those years ago – well this has long gone. In it’s place is new and bright with lots of clean lines and the jewel in the cellar is the lovely decking area next to the cellar door. If the decking could talk, I suspect there would be many a story from the happenings on that deck! Directions to get to the cellar door can be found on the Lonely Grape Cellar Door Map. Their web site is www.pertaringa.com.au . The wine has 10% Adelaide Hills fruit added to the McLaren Vale fruit. Sauvignon Blanc is produced widely in McLaren Vale with quite varied results. This is one of the better ones. The nose has herbaceous tints mixed with the usual cut grass but there is an overarching green apple crispness about it all. The palate continues on the same vain with really good acid length, some minerality and just a slight hint of passionfruit. Bring on a plate of whole grilled or baked fish – preferably caught off some of Australia’s best beaches along the McLaren Vale area coast. This cellar door only offering saw new french oak for a third of the volume (3 months) plus there was some extended lees aging as well. The nose shows this oak treatment with some cedary overtones with hints of green tea and vanilla and a citrus peel finish. The mouthfeel shows a complexity and more viscous coating on the palate. The oak is obvious but not overpowering and the citrus/green tea finish (due to lots of acids). An unusual offering for McLaren Vale that has enough complexity for BBQ’d Pork Spare Ribs. made from fruit from 15 year old and 40 year old grenache. This is lusciousness in a glass – lots of red fruits particularly cherries and a hint of spice on the nose. The experience continues seamlessly from the nose to the palate with the same red fruits (though a little more strawberry), cherries and spice. Now this is why McLaren Vale grenache should be revered in McLaren Vale – so difference to say the Barossa! Charred BBQ meats come to mind with a glass or six of this wine. 45% of this wine comes from the Geoff Hardy K1 vineyard in the Adelaide Hills and is only available at the cellar door. This wine is true to variety – plums all the way and a wonderful mid palate plus finishing with dry dusty tannins. I am thinking lamb dishes with this wine. Has 20% Petit Verdot and this proportion makes a statement with the wine. The nose has the cabernet back fruits combines with the violets one expects from Petit Verdot. The palate is rich with blackberry and black current with the violet undertones continuing. The tannins are well integrated with the rest of the wine. Maybe a Moroccan Lamb Tagine with this wine. The wine has spent 16 months in seasoned American and French oak. The result is full of plums and black fruits on the nose and palate. Good acid and soft tannins also lead to a long finish. I would recommend to drink this wine soon with something that takes a long time to cook – braised lamb shanks or Osso Bucco. I must indicate I have a history with the Over The Top Shiraz – my wife and I had a wine based ceremony where we had the 2000 Vintage of this wine as part of the ceremony! So you can see I do like this wine. About 20 months in oak – 70% French Oak and 60% new and thus shows a cedary oak influence on the nose with the main influence being plums and black fruits. The wine has wonderful length on the palate starting with blackberries and maybe even some beetroot action. Combined with the oak brings a serious mouthfull of a wine. Kepp it in the cellar for a number of years yet (as I will) and I am thinking of Beef Wellington as I write this review. As 2007 was a drought year about 30% of the fruit for this wine came from the K1 vineyard (Adelaide Hills). All the things you expect from a good cabernet are here – blackberries / cassis on the nose and palate. The fruit is almost sweet (though a dry wine) making one think of mixed spices from a Christmas cake along with a long finish of grainy tannins. Another example of how improved Cabernet Sauvignon wines have come from those I tasted in the mid 80’s. Lets try it with a big slice or six of roast beef and bring on the Yorkshire Pudding! At only 7.5% alcohol and slightly spritzig this wine is just like drinking sparking grape juice with hints of orange peel mixed in. Very refreshing and screams to be drunk on hot days with lots of friends around. Cleanskins are also available (not tasted) – $A80/doz – 2009 Verdelho, 2009 Riesling, 2008 Sauvignon Blanc Semillon, 2007 Shiraz Cabernet or for $A105/doz – 2007 Shiraz, 2007 Cabernet Sauvignon & 2005 Petit Verdot. 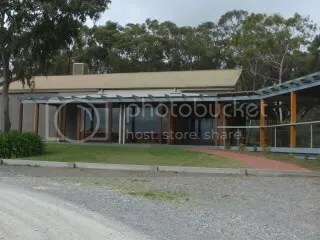 This entry was posted in Mclaren Vale, wine and tagged Cabernet Sauvignon, cellar door, Mclaren Vale, McLaren Vale Wine, Petit Verdot, Shiraz, wine, wine McLaren Vale. Bookmark the permalink.